This was an impromptu investigation while my partner and I were staying at the Bull Hotel. The investigation lasted over two nights. The first night there was just myself and the manager of the hotel. The second night there was the barman, his parents, my partner and of course, me. The manager at the hotel mentioned that the staff at the hotel, including himself, had experienced “strange goings-on” in the hotel. As always, I had some of my equipment in the boot of my car and could not miss the opportunity to conduct some investigations. With the manager’s permission, I had access to all areas of the hotel. I proceeded to do a base line reading of the hotel with the K2 and had two EMF spikes, one by an electric junction box and one in a corridor above the kitchens. On the first evening, the manager and I decided to do a session with the ghost box and the K2 meter. Unfortunately, we had no response from the K2 but the ghost box was very active. After the manager got over the initial shock of the ghost box talking, he asked a number of questions which were answered promptly and intelligently. He then picked up a number of items from a table and asked the ghost box what he held in his hand. Each item was answered correctly apart from one. When he held up a knife, the answer he received was “gibet”. Neither of us knew what a gibet was. The following day we found out that “gibet” was an old terminology for a knife in that area of the country. One the second night an incident happened. It was about 11 o’clock at night when I got out the equipment, the first of which was the K2. Instantly it started to flash and we seemed to get results from the ghost box as well. We asked a number of questions and it seemed to answer us. We also squashed a few myths about the ghosts in the hotel who was actually haunting the place. We appeared to be talking to a young lady who was once a barmaid there. We were asking a number of questions and as we were asking the barmaid a Christmas Menu was standing upright on an adjoining table to the investigation team. Four members of the team watched the menu lift-off the table and spin around in slow motion. Unfortunately, we do not have any video footage of this, however we do have audio of the incident which is on the web page and you can clearly hear the investigation team asking each other “did you see that?”. 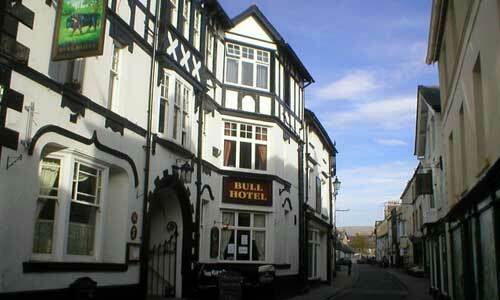 The Bull Hotel in Sedbergh, Cumbria – the scene of an impromptu paranormal by Richard Moody and his partner. The investigation was supposed to last an hour or so but we packed up about four o’clock in the morning. We went down for breakfast the following morning and I was talking to a member of staff explaining to them what the ghost box is. As I was showing them that it is just a modified radio, we were both looking at the speaker and to our amazement, we watched the “on” button switch on and “hello” came out of the speaker. I could see the worried look on her face so I immediately switched it off. I hope to go back one day and do a proper investigation of the Bull Hotel. The Tamworth Ghost Hunters website is here. Ghost boxes work by what is known as sweeping of the FM or AM band. recordings, my own voice, while asking questions, will sometimes be altered by in pitch and pace, making it sound choppy and manipulated. For this reason, I do not believe that ghosts and spirits actually manipulate the audio fragments into forming words to create a message for us to hear. Many subscribe to this theory, but we believe it is incorrect. Our experiments seem to indicate that the spirit voices we record are affected by the frequency changes of the audio which is used as a carrier of the spirit voices. 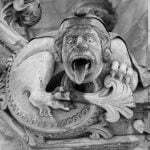 Have a look at are web page 4 more on the ghost box ? Spooky Isles interviews Richard Moody from Tamworth Ghost Hunters. DAVID SCANLAN says he knows the ghosts of Wymering Manor in Portsmouth are a friendly lot because he used to live there!